Showing Sims at work gives us more simple but enjoyable ways to play, though it still needs help from our imaginations. 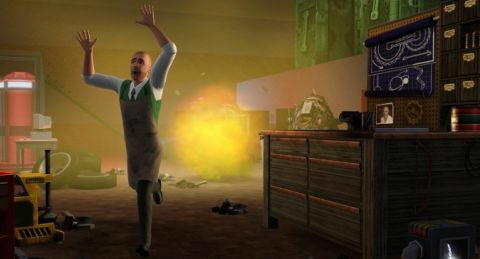 The Sims 3 residents who dressed up for off-screen jobs as Chefs, Policemen or Scientists might as well have been going to daily costume parties. We never actually saw them earn their Simoleons, leaving players to simply fast-forward until their “Hi, honey, I'm home!” return. Ambitions changes that, letting players into that full third of their lives that happens at work. It goes a long way towards convincing us that these little people are living real little lives. Ambitions does a good job of making each of its professions a different experience, despite most player interaction being limited to clicking the button that says, 'Do What The Story Text Just Said To Do'. As a Ghost Hunter or Firefighter, your Sim responds to emergency calls and, while you can actually micromanage for slightly better results, the game will do 90% of the work for you if you let it. So you can sit back and watch your Sim bust ghosts or heroically kick down doors in a flaming building to free trapped Sims. As a Private Investigator, your Sim requires slightly more hand-holding to solve his cases, which range from hacking jobs to tracking down missing property and Sims. Still, most of the fun is in the text descriptions of the cases, which are mostly simple, but are laced with noirish detectivespeak for extra laughs and charm. None of this is the least bit challenging – you literally have to force your Sim to go home and sleep through an emergency to fail – but these professions aren't about adding significant new mechanics; it's about putting on a show to entertain the player. It works remarkably well. The other two professions, the Stylist and Architectural Designer, are very different. They're a clever means of giving players who love The Sims 3 for its excellent character and building editors more opportunities to use their favourite tools. As the Stylist, you're paid to create outfits plus hair and makeup looks for the town's inhabitants – and the new town of Twinbrook is teeming with fashion disasters in dire need. As the Architectural Designer, meanwhile, Sims gives you a generous budget and free rein to remodel their homes to add specified items such as exercise equipment or windows. Of course, cynical players will quickly discover that, like the ability to love, judging things such as style and architecture aesthetic are beyond the abilities of today's PCs. I could dress clients in clashing colours, ridiculous galoshes and the ugliest sunglasses available, but as long as my skill level was high enough they loved me for it. Meanwhile, my architect was hired to build a room for a new baby. I built a tiny, windowless, tin-roofed shack in the back garden and filled it with the required baby items, along with a creepy statue and a chainsaw. I still got paid. It's also annoying when you're hired to add a home gym to a house that already has one, where you can simply delete and then replace the identical items to 'win'. But as long as you pretend to yourself that your clients are smarter than they are, it's all good fun. Ambitions adds other features, including subtle but helpful UI improvements, entertaining and lucrative new Inventing and Sculpting skills, a real-estate market to invest in, tattooing, plus all the extra clothes, hairstyles, traits and miscellaneous objects we've come to expect in a Sims expansion. They're all uncomplicated additions, but Ambitions really gets what The Sims players love about the game, and does a superb job of giving them more of it.